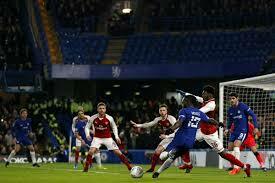 Arsenal and Chelsea played out a goalless draw, in the first leg of their Carabao Cup semi-final clash on Wednesday night at Stamford Bridge. Chelsea boss, Antonio Conte, named a very strong team for the game, but they were unable to see off a patched-up Arsenal squad. In the other semi-final played on Tuesday, Manchester City defeated Bristol City 2-1 at the Etihad. Bobby Reid scored for the visitors from the spot, before Kevin De Bruyne and Sergio Aguero sealed victory for Pep Guardiola’s men.